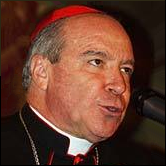 A back-room deal between two politicians in May 2009 helped to make the Dominican Republic the first country to enshrine three current Vatican policies in its new Constitution, which came into effect later that year. One amendment says that “the right to life is inviolable from conception until death”. The other two define the family (rather than the individual) as the fundamental unit of society, and marriage as the union of a man and a woman. By defining life as existing from the moment of conception until death, the “right to life” amendment, outlaws several methods of birth control. This is expected to drive desperate women to the back alley abortionists. The Vatican, however, seems unconcerned at the prospect of unwanted births in a poor country where more than a third can’t afford enough to eat. It’s the Dominican women and children who will bear the brunt of the papal policy, but for the Catholic Church it marks a milestone in a programme drawn up under John Paul II to promote reproduction at all costs. In 1993 John Paul II first referred to a “culture of life”, a concept used to justify Church involvement in “human life from the first moment of conception until its natural end”. The idea is brilliant because, although its main aim is to make sure Church members outbreed the competition, its consistency keeps this from being apparent. Attention is drawn away from the bans on birth control and abortion by two further bans: one on ending your own life (voluntary euthanasia) and another on carrying out the death penalty (capital punishment). Of course, forbidding voluntary euthanasia also serves to give the Church more control over people’s end-of-life decisions, but its primary function seems to be to lend the campaign a consistency which masks its reproductive purpose. And the ban on capital punishment makes it philosophically complete. So strategically brilliant is this “culture of life”, and so blinding is its philosophical consistency, that it was soon adopted by many Evangelical Protestant groups, as well. This, in turn, has given the Catholic Church useful allies worldwide who have helped it in its drive to amend the Dominican Constitution. He also issued an encylical, Evangelium vitae with the philosophical justification for the new campaign. This document reveals a two-pronged strategy. Not only does it effectively exhort women to bear children until they drop, it also obliges Catholic voters, judges and legislators to obey Vatican teaching in their decisions and their votes (§ 73). In other words, not content with urging women to reproduce, it also tries to ensure that the laws of the state conform to those of the Church, so that women have no other choice. On May 11, 2009 the Dominican President and the leader of the main opposition party held a secret meeting where they struck a deal for a mutually beneficial constitutional change. Their amendment did two things: it eliminated consecutive terms for the president and it removed the Constitution’s “never again” clause. This prevented the President from running in the 2012 elections, thus increasing the opposition leader’s chance of winning then, while also allowing the President to run again in 2016. In exchange for this curious arrangement (whose full text was not released), the main opposition party, as expected, voted with the governing party to pass the amendments. This served to enshrine Vatican teaching in the Constitution where it will now forms the basis of the country’s laws. Many Dominicans protested. Both the College of Physicians and the Dominican Gynaecology and Obstetrics Society spoke out, and concerned women took to the streets. On April 21, the day of the first Congressional vote hundreds of women stood behind the barrier in front of the Senate in the afternoon sun, carrying signs such as “No Rosaries on our Ovaries”. They were confronted by riot police and also by the massive “Crusade for Life” demonstration led by the powerful Cardinal Nicolas de Jesus Lopez, Archbishop of Santo Domingo, who also heads the chaplaincy for both the military and the police. It sounds as if he really means “a blueprint”.